Name of the famous clock tower in the City of Jambi. Indonesians are very proud of projects like this. It gives them a sense of development and a step up toward a more modern lifestyle. 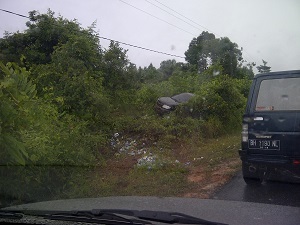 A car that lost control and went up into the brush. We were informed of a “short-cut” between the cities of Jambi and Muara Bulian that would cut down the driving distance by 10 kilometers. During a recent trip to Sarolangun we had the opportunity to verify that information, and we found that the different route was only 4.2 km (2.6 miles) shorter. There are times when we get to enjoy crossing rivers on foot bridges. These bridges can be quite intimidating the first time you cross them, especially when they are missing a few boards here and there. 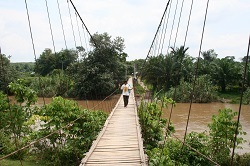 Another intimidating experience on these bridges is when motorcycles come across the same time you are crossing them. Motorcycle traffic is frequent on the one pictured here, and when it happens, pedestrians must stand to the far side and hang onto the cables so the motorcycles can pass behind them. For over a week this lamp had all three lights lit at the same time. Since Indonesia is the 4th most populated country in the world, and the population lives on densely populated islands, traffic safety is a major concern for foreigners. Dangerous traffic conditions pose a more serious threats than that of terrorists, robbers, or pickpockets, etc. There are many negative articles online that that can be read about Indonesian traffic, most of which were written by foreigners who have had very bad driving experiences. While it’s true that there are tremendous challenges to driving in Indonesia, foreigners must understand that they are the outsiders, and their complaining won’t change the traffic situations. There are many cultural and social attitudes associated with Indonesian traffic, and if changes are going to be made they must come from within. The same can be said of the negative social behavior of cutting-into-lines in Indonesia. 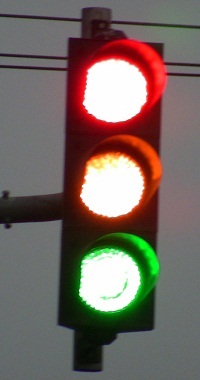 That behavior can be directly associated with driving conditions. Plane used for flights between the cities of Jambi and Muara Bungo. Single prop., 12 passenger, Cessna 208 B Grand Caravan. This information is for those who want to fly to Muara Bungo from Jambi or vice versa. These flights recently started and are still in their developmental stages, so our below information is being continually revised. This picture was taken from the north shore in the City of Jambi. The far side of the river is the WTC Mall. The far upper left is Ancol, from where you can ferry your motorcycle across. 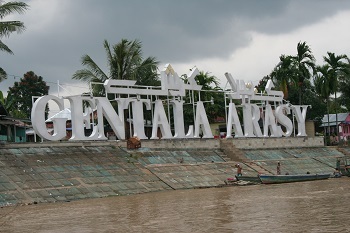 You can get across the Batanghari River in the City of Jambi in less than 5 minutes with a ketek (boat). The location for doing this is Ancol, also known as Tanggo Rajo. 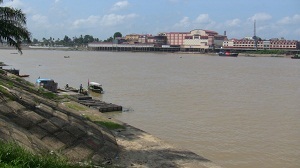 This dock is located on the west side of Pasar Angso Duo, along the bank of the Batanghari River. 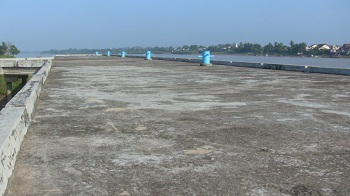 This view is from the east, looking west.